On Thursday, MediaPost’s contributor Les Luchter wrote on both the history of Law & Crime and Court TV, and the viewing experience of tuning in to a live, digital, 24/7 trial streaming network. The network recently announced partnerships with XUMO TV and Pluto TV, substantially increasing the reach and accessibility of the livestreaming program. In his article, Les follows the live trial coverage of the Tammy Moorer case. Tammy Moorer was charged with kidnapping and conspiracy in the disappearance of 20-year-old Heather Elvis. The Horry County Solicitor’s Office alleged Tammy Moorer became enraged after learning her husband Sidney was having an affair with Elvis. Elvis was also reportedly pregnant at the time Mooer learned of the affair. The conspiracy alleged the Moorers planned to lure to and kidnap Elvis at a boat landing. Les recounts the shocking and controversial moment when Tammy Moorer takes the stand in her own defense. An inadvisable move for Moorer, but provided for great discussion between Law & Crime hosts and expert analysts. A South Carolina jury found Tammy Moorer guilty on Tuesday. Prosecutors said she and her husband Sidney Moorer were responsible for the victim’s disappearance in December 2013. A body was never found. After the verdict was announced, Moorer was sentenced to 30 years in prison. 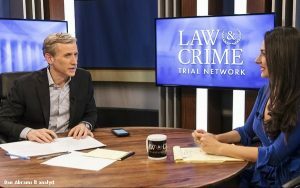 MediaPost’s review of Law & Crime live trial coverage follows a record breaking viewership month for the year-old network. Between the network itself, OTT platforms, social media livestreams and views on the site, Law & Crime provided content for over 5 million viewers, 2.1 million of which were unique visitors, with an average watch time of 30 minutes.